Every day, the workers in your forklifts and other material handling equipment are under pressure to move more product in, through, and out of the warehouse to meet customer demands. It will take a new level of efficiency. It will take a new level of accuracy. It will take the VH10. Built to handle the constant pounding of material handling equipment inside and outside the four walls, with IP66 sealing, an IEC 60721-3-5M3 rating for shock and vibration, sealed connectors and more. Multiple mounting options — including standard RAM mounts and a 10-second quick release mount — plus a compact size make mounting easy, even in the smallest vehicles. A familiar PC-style layout, specially sized function keys, 12 direct function keys, plus 20 years of history developing the most usable keyboard allows you to achieve maximum process simplicity. Replace the two elements that are most vulnerable to damage in minutes, right in your facility — the keyboard and touchscreen. Get true frost and condensation free operation in freezers with touchscreen and board heaters, smart temperature sensors that automatically control the heaters and heating speed, an elastomeric keyboard that works despite icing, and more. The automotive-grade 640 NIT ultra bright display is easy to read, even in bright sunlight; the 5-wire touchscreen is the most accurate and reliable touchscreen technology available; higher “touch life” for heavy use. Choose the wireless technology that best serves your environmental needs and your budget: 802.11a/b/g/n Wi-Fi for compatibility with virtually any wireless LAN and plenty of bandwidth to support any application. 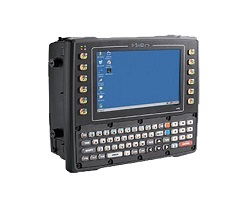 Use the same mounts, accessories and applications you have today for your prior Psion vehicle mount mobile computers (8525/8255), allowing you to cost-consciously upgrade to the latest technologies to improve productivity; customer service and satisfaction. Add a Motorola corded or cordless scanner for fast and accurate capture of any bar code — even codes that are dirty or damaged. Add a push-to-talk microphone to enable instant voice communications with vehicle operators.